Our typical customer purchases up to a half-dozen, less expensive, aluminum shooting sticks before they finally “invest” in a set of ours. While our sticks “cost more” they will save you money over the long run and your grandchildren will be proud to own them one day. The biggest difference between our Shooting Sticks and everyone else’s is our bullet-proof connector. It is milled from a solid block of aircraft aluminum and has three points of contact for unmatched strength. Competitive connectors usually rely on plastic or thin, stamped metal pieces to function which explains why they typically offer a one-year limited warranty versus our unconditional, lifetime warranty. In addition to being strong, they are also stealthy. The most unnatural sound in the wild is a metallic one and a hollow aluminum tube with pointed metal bottoms can make noise that scares off game. Our solid wood shafts and pencil sharpened wood bottoms are the quietest on the market and help you get in close. 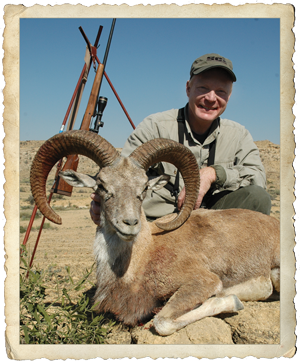 "I am a firm believer in "African style shooting sticks" and have been using sticks from African Sporting Creations for several seasons. This year African Sporting Creations' screw-in tripod has become a permanent part of my gear. I took them to Pakistan in January where I used them "short" to take a Sind Ibex and "long" to take a Himalayan Ibex at long range in deep snow. Right now I am in Argentina-- and you can bet my sticks are here with me!" 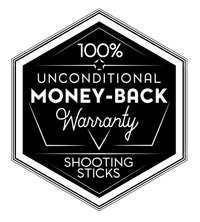 No one ever regretting owning the very best and our Shooting Sticks have earned a cult-like following among PH’s and serious hunters all over the world. 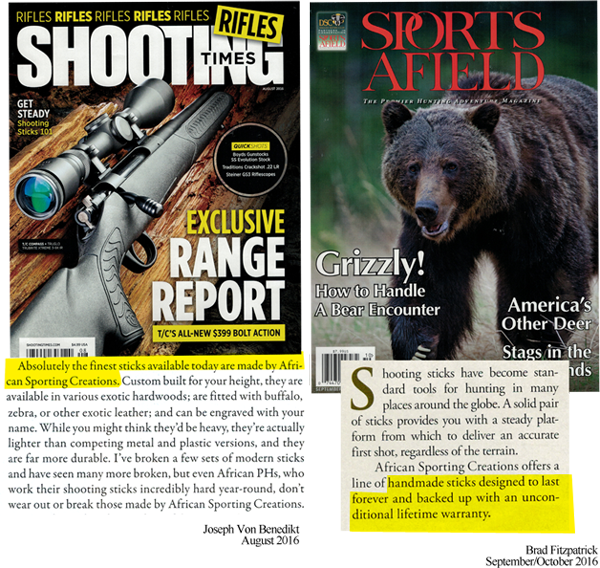 Read for yourself why people who hunt for a living (or live to hunt) consider them without equal!